STH would like to congratulate Habitat For Humanity on the winning the FedEx award for Innovations In Disaster Management in 2013. 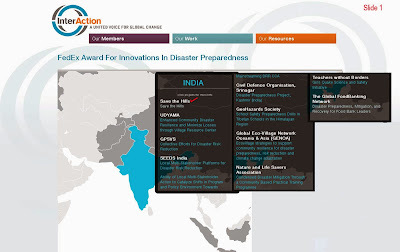 The award was sponsored by FedEx and InterAction and aimed at recognizing innovative interventions that reduce communities vulnerability to hazards or natural disasters and increases their capacity to prevent or cope with such adverse events. Applications from all over the world were entertained, India was unique in the fact that it had the most number of applicants (10 submissions / shown in Slide 1). Although STH did not win , we're extremely proud that we were nominated as one of the six finalists and hope to participate in the award in 2014 too.